MIXING WEEK: The quality of a production lives or dies on the strength of its drums. Modern tracks feature impressive beats that underpin all other elements and smack through in all the right places, balancing gutsy punch with sizzle and groove. Being the rhythmic focus of a track, and with so many processes involved, it's no wonder drum mixing can be such a challenge: a beat will comprise multiple tracks, and not only do you have to perfect the elements individually, but each must also contribute to the collective kit sound, making it difficult to know where to start in the quest for a punchy, cohesive drum balance that sounds just as good as the records you love. So, to help you along the path towards beat-mixing mastery, we've put together this collection of tips, designed to raise your drums to the next level. When putting together a drum mix, think about using contrast as a powerful tool. For example, imagine trying to make every single element of the drum kit sound as punchy as possible, so that all the hits have a similar dynamic profile, meaning that no one element will slap you round the face. Now imagine the reverse: by using a soft kick and a snappier high-pitched snare, the groove will exhibit much more contrast and give each part much more impact. Use contrast with width and placement, too: keep some sounds in the centre of the mix, and pan or spread others out to the sides. 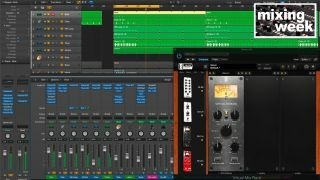 Assuming you're mixing and not creatively designing drums, it's best to use saturation and distortion (via either outboard or analogue-emulation plugins) subtly through gentle direct application or parallel processing. If excessive transients are causing a compressor to work too hard, place a limiter before it in the chain and gently pull down a few dBs of the highest peaks, lessening the compressor's workload. Consider the predelay time when applying reverb to drums. This defines the time delay in milliseconds between the source signal and the reverb, used to virtually distance the source from the listener. Too short a predelay time can mask the source signal's transient, whereas too long can disconnect the two signals. A good way to get the right setting is to initially set a long predelay time, so you can hear a gap between source and reverb, then dial the parameter back until the reverb just merges with the original signal. If you're using more obvious reverb, set the predelay time so that the reverb works rhythmically with the tempo of the track . 5. Is it just louder? When beefing up drums with auxiliary parallel compression, the increase in level will instantly make them sound impressive. Evaluate the effectiveness of your compression - minus the extra loudness - by grouping the two channels and turning them down. Sidechain compression is ideal for balancing the dynamic interplay of drums and other mix elements. Instead of using a channel's input signal to trigger a compressor's sidechain circuit, gain reduction is only engaged when triggered by another selected sound in the mix, causing the signal to drop in volume when the other sound fires at the same time. Identify elements that blur the kick and snare's attack or mask the same frequency ranges, then duck the offending signal out of the way using sidechain compression. Use rapid attack and decay times to engage the effect quickly, and aim for only a few dBs of gain reduction to avoid obvious pumping. Rather than reaching for an EQ plugin, try brightening dull drum hits by layering synthesised white noise underneath. Use longer bursts for snare 'splash', or shorten the noise's envelope to create bass drum clicks. If you're assuming the roles of both composer and mix engineer, it's easy to become attached to certain drum sounds. Stay impartial, and be prepared to change parts as your composition develops in order to accommodate new sounds and help everything fit. For example, a sub-swamping 808 kick drum may sound cool, but the key of your track might mean that a low sub bass will need to occupy the same frequency area. Rather than laboriously EQing both parts to fit, you'll have quicker success by swapping the kick for one that has a higher fundamental frequency. Drummers are human, meaning that imperfections can easily find their way into a performance. When that happens, drum replacement software can be used to replace dodgy hits with perfect ones, using the signal of the offending beat to trigger a one-shot sample, which can either be layered over the original or used to replace it entirely. For the best results, you'll want the samples to be sourced from the original kit, of course; so once you've finished recording your drum track, capture a handful of hits in isolation for replacement purposes. Get the drummer to strike each piece of the kit several times at varying forces, leaving plenty of space in between for the decay tails and you're good to go.